The design for this wood mantle evolved over the course of several weeks. The homeowner had brought several pictures to us. Each mantle photo showed a very different style - each contained different aspects from Arts and Crafts and Old World styling, representing different time periods. We ended up choosing features from each design, and formed them into a hybrid. The four windows above the fireplace did not exist in the original floor plan. We added the windows and created a dormer, which brings detail to the rear of the home where you don't typically see detail work. 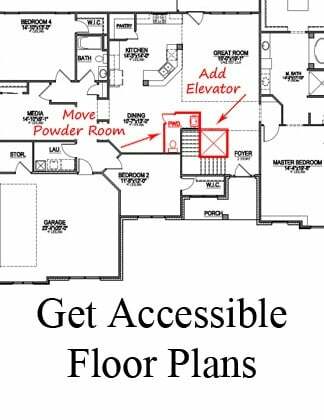 What other special features were added to this home plan? 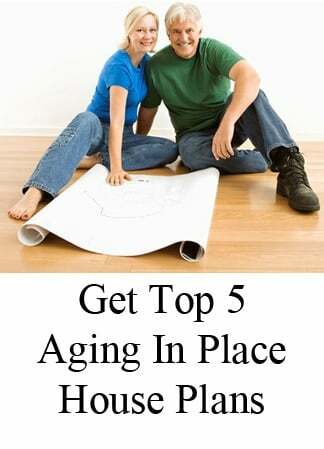 Learn more with photos, below. Contact Stanton Homes to learn more about how custom home pricing works, here. 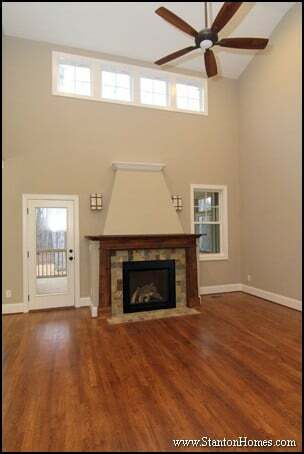 The fireplace is the centerpiece of the great room "feature wall," visible as you walk in the front door. Lines of sight are always important to keep in mind. You want to place walls in such a way to give a glimpse of special features from nearby rooms (like the right side of this fireplace), without giving away the full effect. 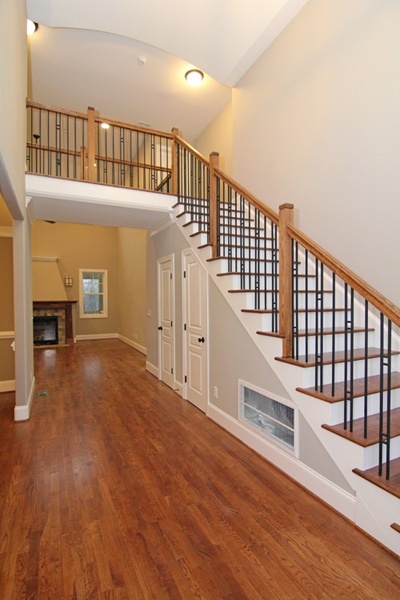 The stairs and overlook use square Aalto Collection contemporary balusters, complimented with square knoll posts. We also had a lot of conversations about how to integrate the round, diner style island and raised bar, in a way that could complement the strong fireplace. The legs on the mantle are smooth cedar and stained to match the site finished hardwoods. The tiles form a 4x4 mini mosaic. The mantle itself is at 54" (the most natural height when the fireplace sits on the floor according to our expert interior designer). The wood stain is called Minwax English Chestnut. 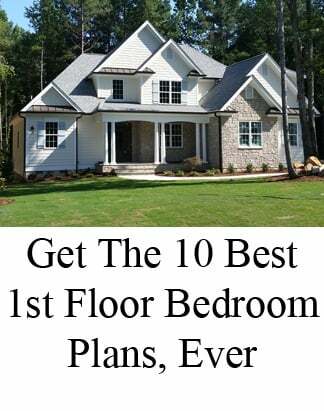 The angled legs draw your eyes up to the mantle (and help emphsize the two story height walls). That angle was then mimicked with round drywall corners that leads up to the cap that is completed with crown molding and a lid. 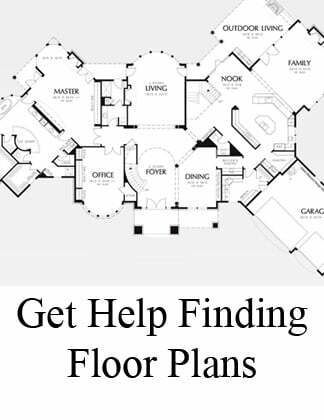 Another professional home design tip is to integrate certain features and aspects in multiple areas of your home. For instance, the tapered columns on the front porch match the craftsman style of the mantle. While the mantel is stained wood, the columns are painted cedar. Similar columns styles give eye-pleasing symmetry to the home. 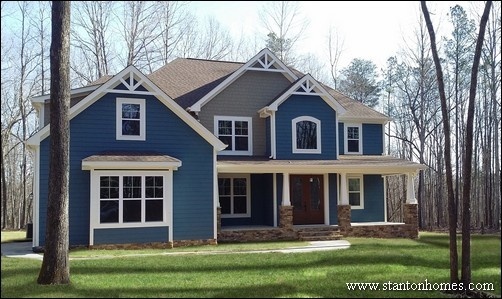 Phil builds uniquely crafted custom homes in the Research Triangle region of North Carolina. He builds relationships with clients the same way he builds their homes - with dedicated attention to detail. 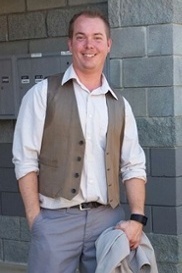 Phil has been a trailblazer with Stanton Homes since 2006. In his free time, Phil enjoys running, kayaking, and anything outdoors. 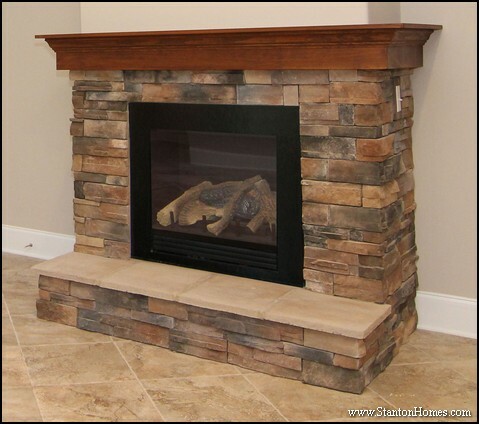 Browse popular fireplace wood and stained mantel designs, in Raleigh, NC custom homes. Which fireplace styles stand out? 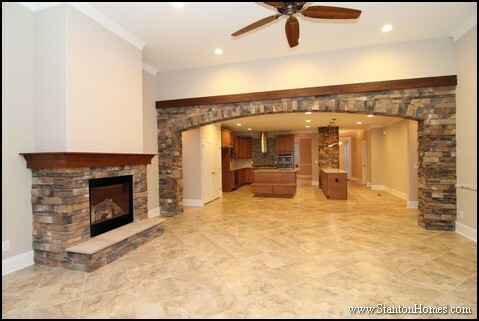 Tell us which photos are your favorites, and we'll show you what it costs to build the perfect fireplace into your custom Stanton Home. 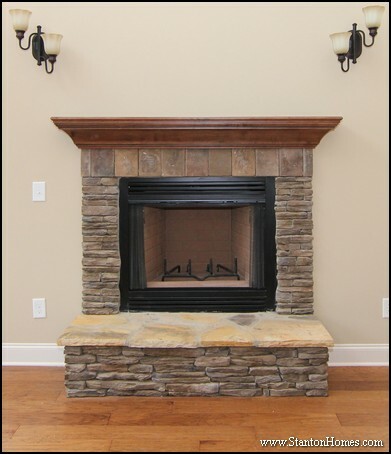 Mantels add the finishing touch to a fireplace - offering character and utility to the space. These stained wood mantels are paired with stone and brick surrounds. 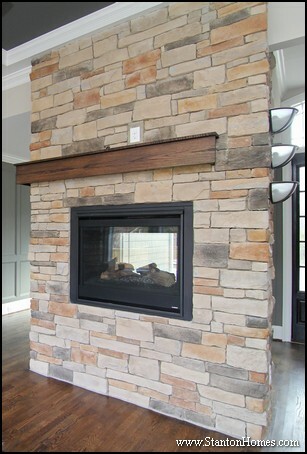 Stone and wood complement one another on this custom gas fireplace. The wood mantel offers easy-to-reach display storage, with a bench style hearth below for seating. Heat warms this great room with the flip of a switch. Click here to view a photo gallery of this home, a version of the Coquery Cottage. Wall sconces help create a showcase area above the stained wood mantel. The mantel wood design mirrors the crown moulding along the ceiling of this great room. A raised flagstone bench offers seating beside the wood-burning fire box. A mixture of stone shapes and styles gives dimenstion to this fireplace, making it feel large enough to fill the open concept space. Click here to view a photo gallery of this home, a version of the Bostwick. Natural stained cedar is used in this indoor-outdoor fireplace design (with exterior siding running from floor to ceiling behind the fireplace). Click here to view a photo gallery of this home, a version of the Dinsmore. 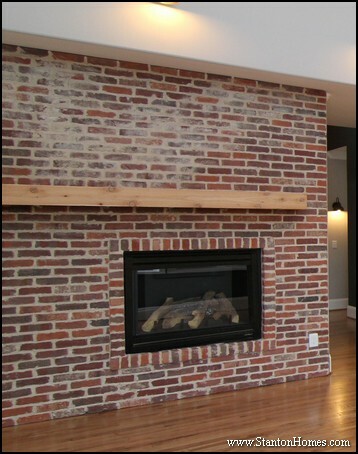 This red brick fireplace - in a rustic-contemporary style custom home - features a natural wood mantel above the gas fireplace insert. Click here to view a photo gallery of this home, a version of the Worthington II. This hand-crafted hardwood mantel was built on-site in this Apex, North Carolina custom home. Wall sconces add symmetry to the two-sided wrapping mantel. Click here to view a photo gallery of this home, a version of the Bryson. 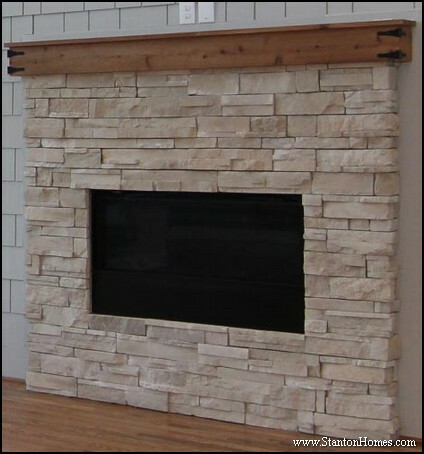 Looking for more fireplace ideas with stone, painted or other mantel styles? Click here to view over 80 fireplace design idea photos on Houzz. A custom fireplace can serve as the focal point of any room - from the kitchen to the master suite - with a range of design features and functionalities crafted to suit your lifestyle. 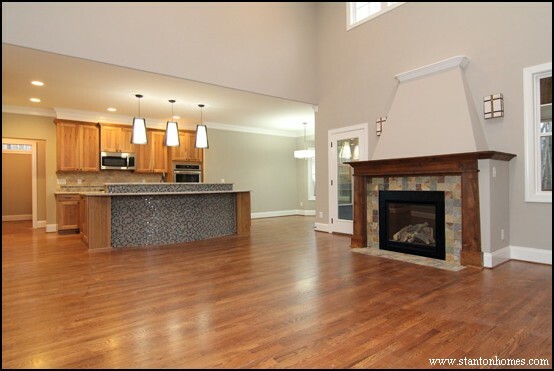 Click here to contact Stanton Homes or call 919-278-8070 to talk about the custom home (and fireplace) you want to design and build.